The all weather luxury cruise boat - M.V. 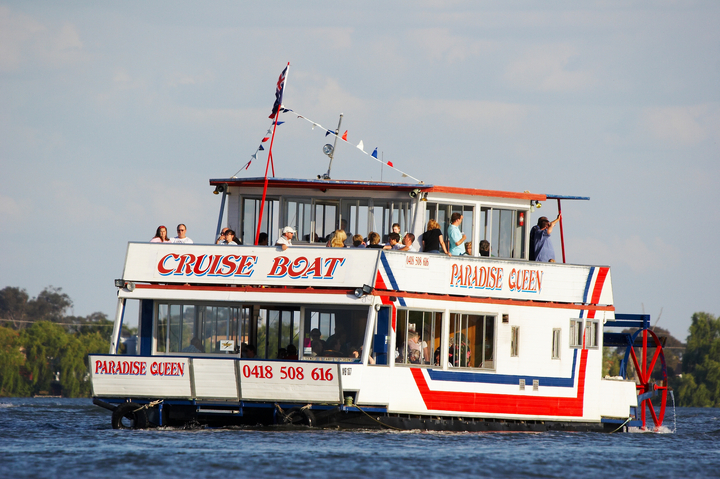 Paradise Queen - cruises on Lake Mulwala and the Mighty Murray River at Yarrawonga, Victoria. Licensed to carry 75 passengers, the Paradise Queen departs daily from the Yarrawonga Foreshore and the Mulwala Water Ski Club. We offer a range of menus and cruising options specialising in Group and Party Bookings with special rates available. Both sides of the lake have attractive foreshores that provide a year-round recreation area, including picnic and barbeque facilities, shaded seating areas, walking tracks, waterslides, playgrounds, a skate park, swimming pools and a splash park. The Splash Park is located next to the waterslide and kiosk, and has motion activated water features. Great for the littlies, especially on those hot days! The Splash Park is open from 10.00 am daily. Ride the waterslide one, five or 15 times, and when you've had enough grab an ice cream from the kiosk. Waterslide Costs: $0.60 single ride, $2.60 five rides, $4.10 ten rides, $9.30 all day. SKI RIDES is a water based business on Lake Mulwala in northern Victoria as an attraction for tourist and resort clientele. Lake Mulwala is a 6000 hectare lake built in the late 1930's for the purpose of farm irrigation, with a constant supply level through flood or drought - making for a superb water sporting destination. We have operated on this lake, from the twin towns of Yarrawonga - Mulwala for the past 49+ years, growing as tourist demand required to our present size of 20 water craft from Canoes,Hobie Pedal Kyaks, Fishing Boats, 10 or 12 seat BBQ Pontoons & Ski Boats. Receive lessons by the professionals themselves whist having the leisure of riding in their luxurious boat. The guys at the pro shop are also there to help with all of your water needs as they have a fully stoked shop with the latest and best in wakeboard and skiing gear, and also the best advice and training that Australia has to offer. Wander through our 100 year old store and sample our huge range of flavoured olive oils, salad dressings, grommet olives, dukkah, jams, relish and sauces all set our for an extensive sampling daily. Expereince our gorgeous room of natural beauty and skin care products and herbal teas. Enjoy a coffee while relaxing in our delightful garden surrounds or by the open fire place in winter. Our large covered outdoor area is warmed by wood fire and gas heating and cooled by Ozmist fans over the hotter months. Our 50 metre² aquatic playground, caters for kids 7 years to adults who love a fun challenge. The park includes awesome waterslides, trampolines and obstacle courses. Sit back, relax and enjoy refreshments from our fully licensed bar, kiosk and eatery “The Paddle Box Kitchen”. Offering a seasonal set menu and cruise packs for lunch, afternoon tea and dinner. All whilst you are captivated by the sights of Lake Mulwala and the Murray river and enhanced by the sounds of the paddle wheels and genuine wood fired paddle steamer. You will find 10 acres of a spectacular garden divided into their countries of origin in eight different trails to explore. There are no cacti native to Australia, although, as you’ll see, they feel very much at home in our environment. While out in the garden you may see a plant that would look great in that pot you’ve recently bought or perhaps you are starting your own Cactus garden, we sell cuttings!